Well, okay… I made you the filling of a pie. I don’t do crusts. Remember when I tried? Yeah… not happening. But I made croissants so that makes up for it. Hmmpf! Way back when I shared a chocolate chip cookie pie that I found on a yellowed scrap of newspaper in my mom’s recipe box… and it literally tasted like a giant chocolate chip cookie. It was oooey and gooey and even… chewy. Yes. I’ve only made it once since then because if it’s made, it’s eaten. Just try it. Double dare. So… I made the pie with pumpkin. Know why? Because I dreamt it. Yep. I’m totally serious. 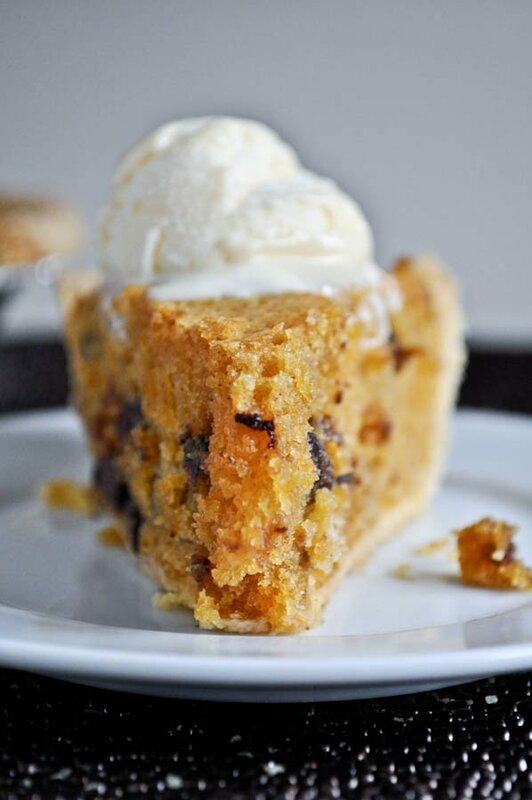 I woke up on Sunday morning with one thought in my mind: pumpkin chocolate chip cookie pie. It was blaring in my head like a siren. I have no idea why. See, for the last four weeks I’ve been trying to perfect a seriously CHEWY pumpkin chocolate chip cookie. Yes, I’ve had the normal pumpkin chocolate chip cookies. They were one of the first recipes I ever posted here, complete with pictures to make your skin crawl. Buuuut… I’m done with them. I don’t even want to see another one. I want chew, not cake. CHEW. If I want a cakey cookie, I’ll make a darn cake. I want a cookie that chews and spits out melty chocolate chips. I’m probably the reason for the pumpkin shortage because, um… I think I’ve gone through at least 10 cans trying to perfect these stupid chewy cookies. It’s driving me insaaaaaaaane! Good news is I’ve nailed it and will share it soon enough. Better news is that this pie was worth sharing over those cookies. I’m convinced waking up with pumpkin cookie pie on the brain was the universe’s way of telling me to lay off the cookies. Not all of it. It’s still cookie-like, it just definitely adds a bit of cakey-ness. But I’m not one to complain. (<– really? since I’ve now complained this entire post.) I’m so annoyed with pumpkin right now. Why can’t it have chew-inducing molecules, or whatever the heck it has to have to stop being so cakey? Anyway, I wanted to pie myself in the face with this. If that tells you anything. In the bowl of an electric mixer, beat eggs until foamy. Beat in flour, sugar and brown sugar until well blended. Add in vanilla extract, pumpkin and pumpkin pie spice and mix until combined. Blend in melted butter with mixer on low speed, then gradually increase to high and beat until mixture is combined and you have a batter. Toss chocolate chips with a sprinkling of flour and fold into batter. Pour into an unbaked 9-inch pie shell. Bake for 55 minutes, or until center is no longer jiggly. Serve warm with ice cream of whipped cream. Edited to add: I have tested this recipe four times and the measurements are correct. You MUST cool your butter completely. You also MUST use an electric mixer. And third, you MUST mix the butter in thoroughly with your electric mixer until a batter is formed like the first picture above. Feel free to add more pumpkin, but if you do that you will essentially have a pumpkin cake inside a pie crust. Other than that, the measurements are spot on. The key is you must, must, must let that butter cool. P.S. Sorry about the store bought crust. But not really. I haven’t made this in almost a year. It’ll be our dessert Thanksgiving night. I am so freaking excited! I had issues with it being a bit too liquidy last night but it was still amazing. I saw the edited portion this time so I’ll try it that way. Not that it matters this pie IS TO DO FOR! I’ve been wanting to make a chocolate chip pumpkin pie for a while. I came across your recipe when googling for a good recipe . I am so glad I found it!!! It was amazing. I followed the directions exactlyand while it did not turn out as your pictures, it still turned out pretty incredible. The only things I did different was use the chocolate ready to bake Keebler pie crust and instead of regular whipped cream or cool whip I used the cream cheese frosting from Cool Whip. Turned out amazing! OMG! I made this pie for Thanksgiving and everyone voted to make it a yearly dish. Adults and kids alike loved this pie. When you said that adding too much pumpkin would make it a cake in a pie shell, that would definitely be correct. Also, make sure not to overcook it or you will end up with a cake like texture. It was great! Have you ever tried it in a gingersnap crust?? Cannot wait to try because I love chewy cookie textures. Instead of this being ‘pake’ at a ‘pakery’, this is ‘pookie’, which is even better! The Drop Dead Diva fans can appreciate this. Thanks for sharing – love your blog. I just put this in the oven. My 5-year old son helped me put it together. It looks so good! I licked some of the batter. YUMMY!! I make this every year and everyone loves it!!! Pingback: On Film and Fall and Sophomore Year | Tea, cats, and life. The butter is technically not being “cooled” if it’s bring brought up to room temp. That’s probably confusing terminology for the majority of people out there. I have been surfing the web for some dessert recipes in which I can sub the pumpkin for sweet potato and I think I found one. Thanks this looks absolutely wonderful. Mix the above together and then place in bottom & sides of greased pie pan (I use spray), then add in filling. by the way, the filling filled up PERFECTLY. It looks and smells AMAZING! will see what my son and my boyfriend think. we will eat it with some vanilla ice cream (or frozen yogurt). I will post pics on instagram under robinmommy. so you can see… also on facebook under Robin M. Berman. Thanks from a fellow foodie!!!!! I made this and I suggest using half the butter the recipe calls for I kept having to take it out the oven and wipe of butter from the sides and middle of the pie. Just cooked this up. Had no problems with the batter after following posted instructions. Looking forward to trying it!